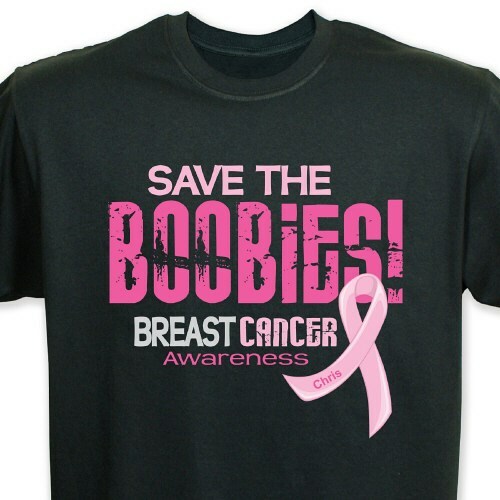 Help raise awareness for breast cancer with our Save The Boobies Personalized Breast Cancer Shirts. With this fun and unique design, both men and women can now show their support together. Wear this Breast Cancer Awareness Shirt to all your awareness walks and events in October for Breast Cancer Awareness Month. Our Save The Boobies Breast Cancer Awareness Shirt is available on our premium preshrunk black t-shirt, machine washable in adult sizes S-3XL. Includes FREE Personalization! Personalize your Breast Cancer Awareness T-shirt with name or ask for no personalization. Great shirt. Fun, reasonable price! Fast shipping for something that is personalized. MyWalkGear.com offers many Personalized Breast Cancer Gifts. These personalized gifts, which help the fight against breast cancer, are great for charity events or Breast Cancer Awareness walks.